If you're looking for a slightly different take on your oatmeal cookie recipe, you'll want to try these Maple Oatmeal Cookies. Just be forwarned that the recipe calls for pure maple syrup because imitation maple-flavored syrup just won't do them justice! Pure maple syrup is made from the sap of maple trees which is heated to evaporate the excess water leaving the pure concentrated syrup behind. Maple syrup is also graded according to how dense and translucent it is. In the United States, maple syrup is either graded as Grade A or Grade B. The Grade A syrups tend to be lighter in color with a milder flavor. The state of Vermont is the leading maple syrup producer in the U.S. The imitation maple-flavored pancake syrups usually do not contain any pure maple syrup and the main ingredient is often high fructose corn syrup. For the best results with these cookies, you'll definitely want to use pure maple syrup instead of the less expensive pancake or waffle syrup. Preheat oven to 350F. Line cookie sheets with parchment paper or silicone liners. In a large mixing bowl beat shortening with an electric mixer on medium to high speed for 30 seconds. Beat in half the flour. Add maple syrup, egg, milk, baking powder and salt and beat until combined. Stir in remaining flour and oats. Stir in raisins and nuts (dough should be soft now). Drop dough by heaping teaspoons about 2 inches apart onto prepared cookie sheets. Bake for 13 minutes or until edges are lightly brown. Remove from oven and let cookies stand for 1 minute on sheet before transferring to wire racks to cool. 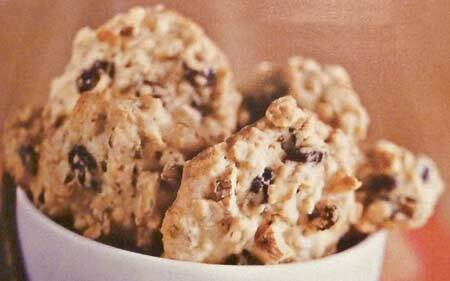 This recipe yields about 40 Maple Oatmeal Cookies.